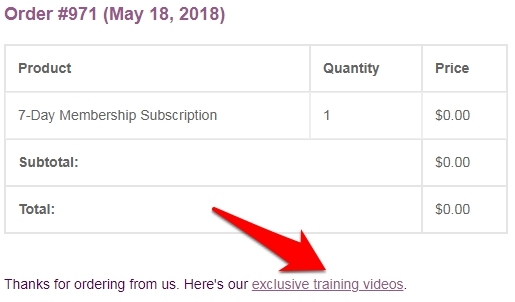 Woocommerce Integration extension allows you to embed any text including a private magic link to your exclusive content into any WooCommerce order emails. The extension first inserts a magic link to your private content protected by Protect Pages & Posts extension, then makes use of Private Magic Links extention to set a different expire time for the private magic link. Let’s go through its settings and see how you can integrate this extension with your protected content. Once you’ve activated PDA WooCommerce Integration plugin, a new tab called “WooCommerce” will appear under “Protect Pages and Posts” settings page. You can choose any WooCommerce email templates to insert your custom text into. These emails are set and sent by WooCommerce according to your customers’ order status and can be configured under WooCommerce’s email settings. Insert any text that you want to include in the chosen WooCommerce emails above. Note: The text within the square brackets  will become a so-called “private magic link”, which expires after a period of time that you can preset below. Your customers will be able to access your exclusive content via this link after purchase. Choose an exclusive page and post that you want to link the text above to. Please make sure this private page is protected in order for the magic link to expire. Select where to insert the custom text above on your WooCommerce emails. There are 3 positions for you to choose. 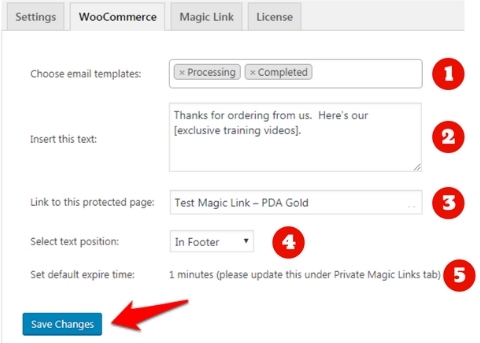 Set a default expire time for the magic link embedded on your WooCommerce emails. In other words, the link to your protected content won’t be accessible after this period of time. Please purchase Private Magic Links extension to customize the expire time of the magic link. Otherwise, it will expire after 7 days by default.